BRKLYN is growing to become one of Adelaide’s biggest east-end Gin and Cocktail bars. Tucked away along Rundle Street, the modern bar embodies the feeling of the Big Apple, while adding its own unique twist to bring something unique to the CBD. As you climb the stairs above the Schnithouse you find yourself in a New York subway station, passing a small deli, soon to be pizza bar, and a radio station, before you enter the bar itself. Overlooking Rundle Street, BRKLYN gives off a lovely atmosphere with warm moody vibes from its lovely stonewalls, concrete floors and metal décor that give a slight industrial feel. Owner and Director of BRKLYN, Rashaad Cezar, says the space has been open for almost three years but now wants to do a bit of revamping to make it a new hit and provide a place for everyone to enjoy. “We are really enjoying being super busy and we really want to do something a bit different and really flesh out the cocktails and flesh out the food,” he said. Sending their chef to New York and surrounding areas for inspiration, Rashaad hopes to bring a piece of Brooklyn to their new menu. “We are really just trying to capture everything that represents Brooklyn in Adelaide,” Mr Cezar said. Last week, we were lucky enough to be able to taste some of the flavours of America with their new bar menu, which focused largely on shared platters; perfect for a friends night out or a romantic date night. 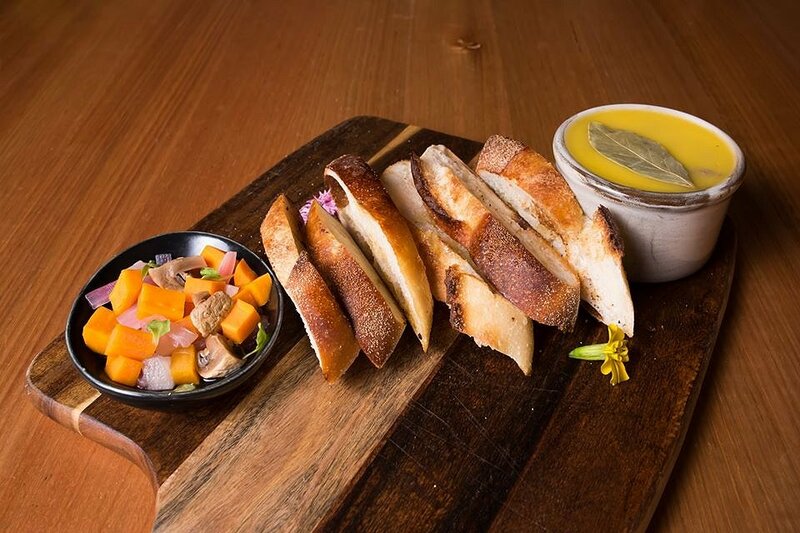 Pâté Pickle Platter was a share plate with truffle pâté, assorted pickled vegetables and sourdough baguette. The strong smoky flavour of the truffle mushrooms was prominent and a hero flavour of the dish. This pâté was lovely and creamy and there was a generous serving with a buttery olive oil topping. The crunchy pickles gave a sweet tang that lifted the palate, while the crunchy crust on the bread added a lovely texture balance with the smooth pâté. Overall this was a delicious platter that is sure to get any guest in a good mood. 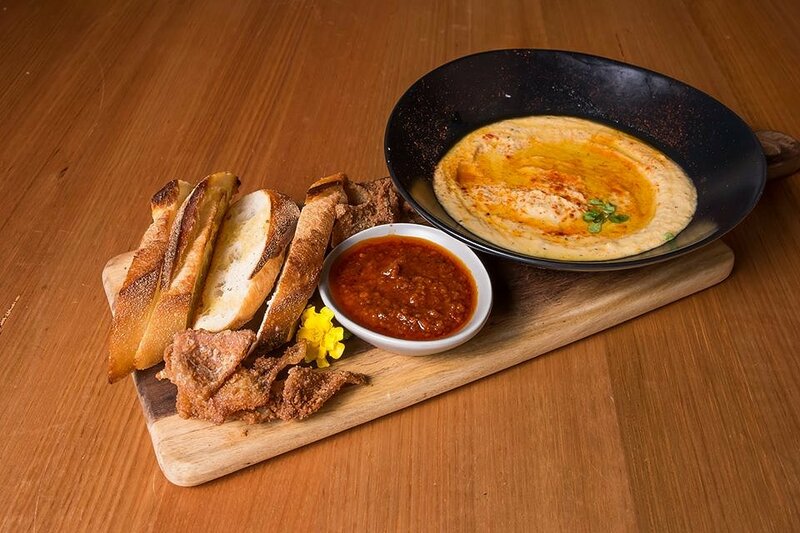 The Hummus + Fried Chicken Dip platter was served with house-made hummus and Nduja, with crispy chicken skin dippers and toasted sourdough. The house made hummus was lovely and smooth with very prominent earthy flavours and lifting aromatic tones. The chicken skins were wonderful and spoke American style. The chicken skin pieces were delicious and juicy but with a crunchy outer, adding another level of savouriness with both sweet and earthy flavours that balanced with the Nduja. The Nduja is a type of salami paste that held a slight spiced flavour that left a heat in your mouth, however, the sourdough and chicken helped to cool the palate. The Baked Brie platter was another strong dish. 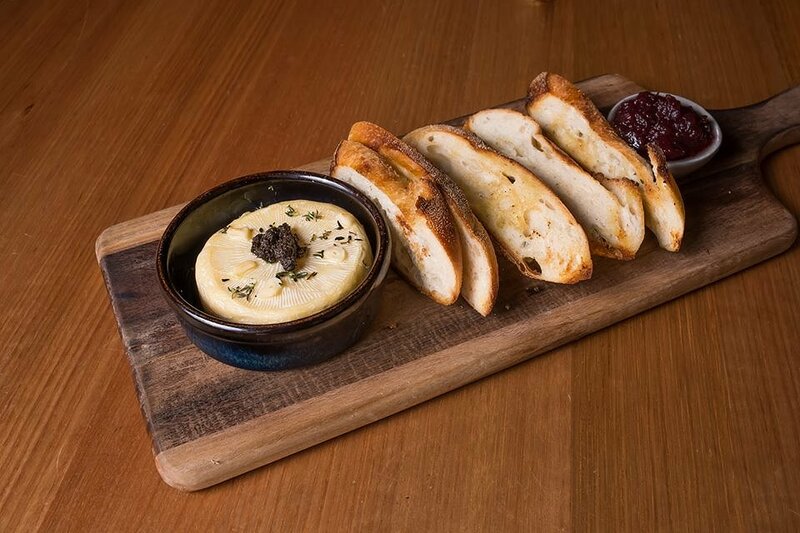 The baked Brie cheese with a truffle garlic glaze, cranberry sauce and toasted sourdough was the perfect nibbling plate. The lovely warm whole Brie was wonderful and creamy and spread perfectly on the toasted sourdough, while the truffle garlic gave a lovely flavour hit that complimented the heavy cheese flavour. The cranberry sauce was lovely and sweet and balanced well with the savoury flavours of the bread and cheese. If you are anything like me and are a slight sweet tooth, this platter will definitely satisfy those cravings without having to buy dessert, with the lovely cranberry sauce sweeting the dish. 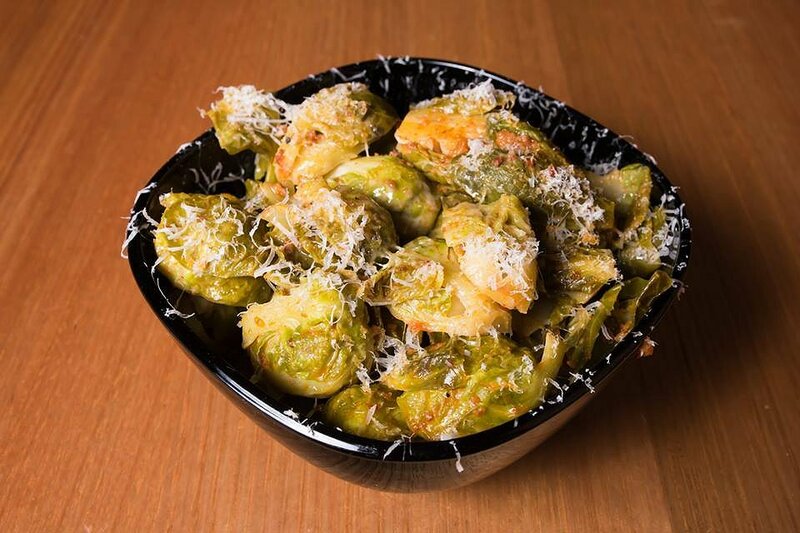 Nduja + Parmesan Sprouts is brussel sprouts sautéed in butter with Nduja, and topped with shaved Parmesan cheese. This dish was a pleasant snack that would please anyone trying to be a bit more healthy with their bar food choices. The brussel sprouts had a slight spice to them from the Nduja salami paste, while the sprouts themselves were cooked perfectly. The tang of the Parmesan cheese gave a lovely flavour combination and added a creamy element to the dish. I am never normally a huge fan of brussel sprouts but I would happily eat these, with its lovely array of flavours; the spices and the nice slight crunch from the sprout giving that fresher flavour which balanced out the dish. 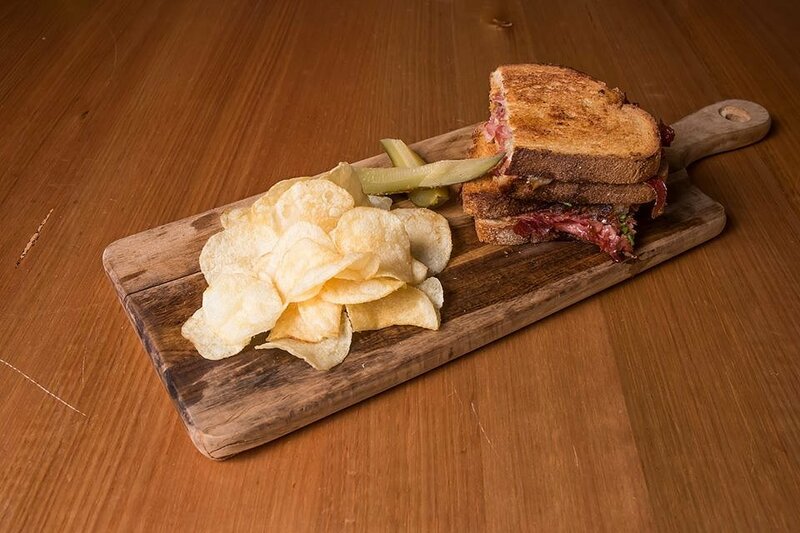 The Pastrami Reuben Sandwich is made with pastrami, Swiss cheese and sauerkraut, with a secret sauce, toasted on rye with dill pickles and crisps. This was a very delicious meal so we weren’t surprised when owner, Rashaad Cezar, said it was a customer favourite. With every bite, we gained a lovely sweet tang from the generous amount of secret sauce, which has a sweet BBQ flavour. The pastrami gave off a strong savoury tang, while the lovely melted cheese helped balance the flavours. This wonderful toastie with crunchy, buttery bread and thick cheese, balanced well with the sweet tang from the sauerkraut. All the flavours worked well together and overall was a lovely dish. The Fried Chicken Bites also spoke American. 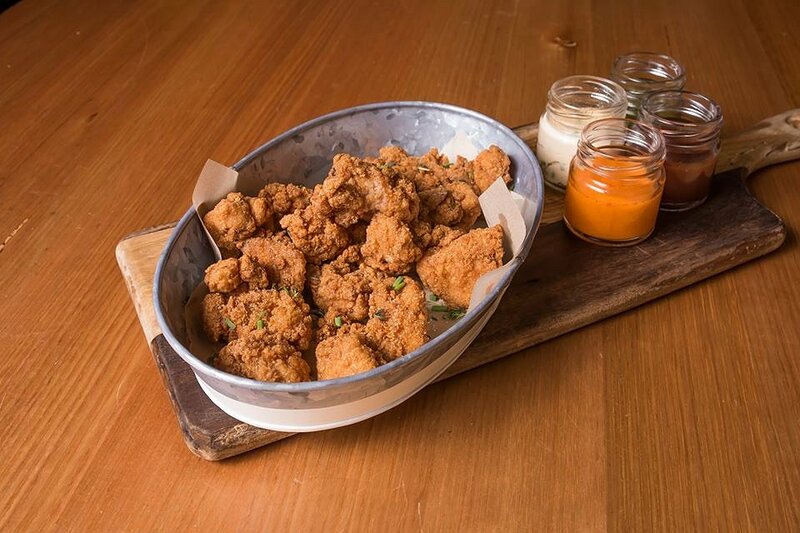 The Bourbon and Buttermilk brined tender chicken pieces were deep fried and served with an assortment of dipping sauces. The chicken had lovely crispy skin that was very crunchy. The coating also had a slight spice, however it wasn’t overpowering and will still be mild enough for those who don’t like spicy foods. The chicken was well cooked and tender and paired well with the array of dipping sauces: A sweet and sour BBQ ketchup that had a slight tang; a slightly spicy aoli, which was light and creamy; a mint-based sauce, that was lovely and refreshing; and a spicy pepper sauce which will be perfect for those who like to add a bit more spice. Overall it was a lovely mix of sweet, savoury and spicy sauces to satisfy everyone’s cravings, and they all pared perfectly with the chicken. BRKLYN is passionate about giving customers a wonderful experience by serving up the best quality food with the best ingredients they can find, and it sure was evident from the tasting. “Our motto has always been, ‘Premium quality, premium service without the pretentiousness’. That has always been a big thing for us. […] We want to be really welcoming and inviting and that does show through our clientele as everyone has a really good time, without feeling left out,” owner Rashaad Cezar said. BRKLYN can also cater for any dietary requirements as the brussel sprouts and hummus dishes can be easily changed to vegan and almost everything can be served gluten free as well, so there are plenty of options for everyone and no one misses out. If you are looking for an American getaway without the price tag, BRKLYN is the next best thing. With wonderful Gin and Cocktail drinks on offer and a lovely new bar menu, BRKLYN is sure to make you feel at home and help you have a good time, while immersing yourself in a little bit of Brooklyn. So come see the people at BRKLYN and if you are planning to head there in April, make sure to keep a look out for their third birthday celebrations, with a big renovation and plenty of surprises to come. Open Tuesday to Friday, 4pm till late, and Saturday from 6pm till late.